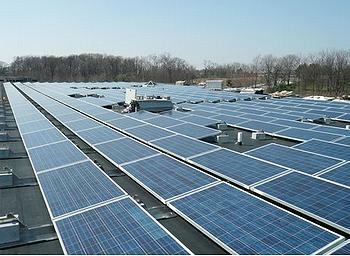 WASHINGTON, DC, June 23, 2011 (ENS) – A three-company consortium and the U.S. Department of Energy Wednesday announced a a partial loan guarantee from the DOE’s Loan Programs Office to help finance the largest distributed rooftop solar generation project in the world. The 80 percent loan guarantee supporting $1.4 billion of debt facilitates a total project size of about $2.6 billion, which is being financed by the private sector over the next four years. Announcing the offer, Energy Secretary Steven Chu said the project, known as Project Amp, will support the installation of solar panels on industrial buildings across the country. The electricity generated by those panels will contribute directly to the electrical grid, rather than powering the buildings where they are installed. “This unprecedented solar project will not only produce clean, renewable energy to power the grid in states across the country, but it will help us meet the SunShot goal of achieving cost competitive solar power with other forms of energy by the end of the decade,” said Secretary Chu. “In addition, Project Amp will create at least a thousand jobs across the U.S. and increase our global competitiveness in the clean energy race,” he said. Working together, a bank, an industrial real estate developer and an energy utility will make the project happen. Bank of America Merrill Lynch is acting as sole financial and structuring advisor and sole lender on this transaction. “This important accomplishment transforms the dynamics of distributed solar generation, delivers a significant source of clean energy and creates thousands of jobs across the U.S,” said Tom Montag, president of Global Banking and Markets with Bank of America Merrill Lynch. Prologis, which owns, operates and develops industrial real estate, will provide site access to rooftops and will also act as developer, construction manager and program sponsor, in addition to making an equity investment. Electric power company and solar energy developer NRG Energy will fund the first phase of the project over the next 18 months. NRG has a right of first offer for the rest and will provide development resources and project expertise for the installations. This distributed solar project will generate employment across 28 states. Once fully funded and completed, these installations are expected to provide approximately 733 megawatts of distributed solar energy, which is enough to power up to 100,000 homes. “NRG believes rooftop solar is a smart choice for industrial, commercial and residential property owners in markets around the country, and this program provides the commercial scale that will bring the benefits of solar power to customers across the country,” said Tom Doyle, president of NRG Solar. “This program will nearly double the amount of grid-connected solar online in the United States today and make another positive contribution to cleaner air and a healthy environment,” Doyle said. The three firms now are finalizing the financing documentation for the distributed solar project and preparing to begin the first phase of installation. Of this first phase, 15 megawatts of solar capacity is ready for construction and installation in Southern California, where the power generated will be sold to a local utility under long-term power purchase agreements that have been approved and executed.